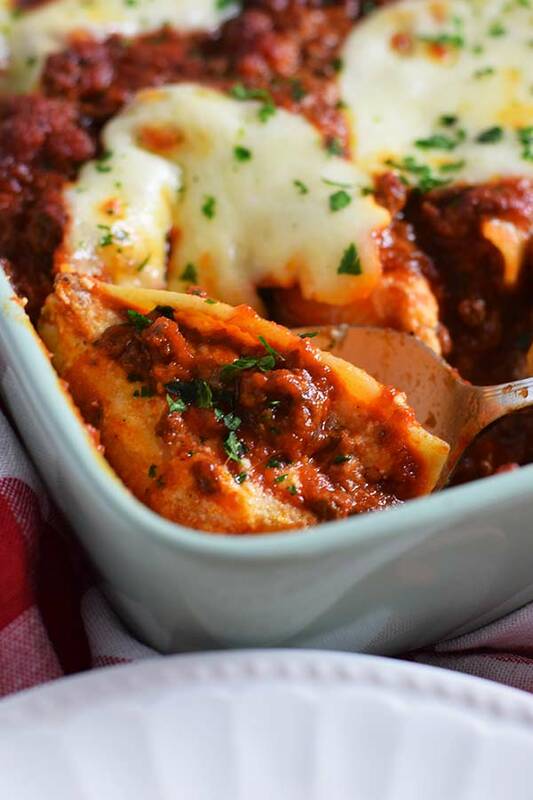 Easy Baked Stuffed Shells are jumbo pasta shells filled with creamy ricotta and Italian cheese baked in a deliciously rich meat sauce. 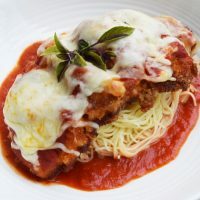 If that isn’t scrumptious enough, they are topped off with soft fresh mozzarella slices and baked to perfection. I may have mentioned a time or two my affection for Italian food! One day I will make it to Italy, I promise. It’s at the very top of my bucket list. For now I will dream of days touring vineyards and piazzas filled with beautiful historical buildings. 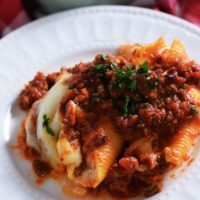 These stuffed shells are one of those magnificent meals that is filled BIG flavor and lots of love. To me a lot of it is in the sauce. I like mine with a rich meaty sauce. My Kicked Up Spaghetti Sauce from a Jar is perfect for this recipe. You won’t believe how easy and insanely good this sauce it! 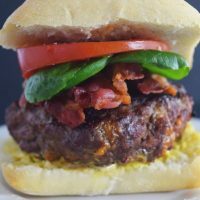 Add to it a creamy Italian cheese center and these bad boys are just KNOCK it out of the park good! 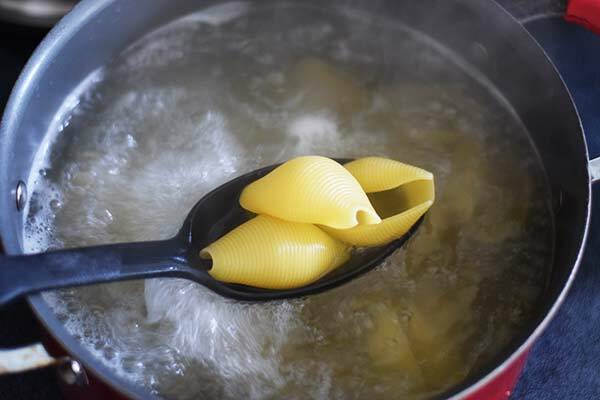 Step 1: Boil the Jumbo Noodles according to the package instructions for baking. If it doesn’t include that you should cut the time in 2/3. The ones I always use are 9 minutes if baking and 12 if not. Place on a flat surface to dry. I use a baking sheet. Step 2: In a large bowl, mix ricotta, 2 cups of shredded cheese, salt, pepper and garlic. Taste and add salt if needed. 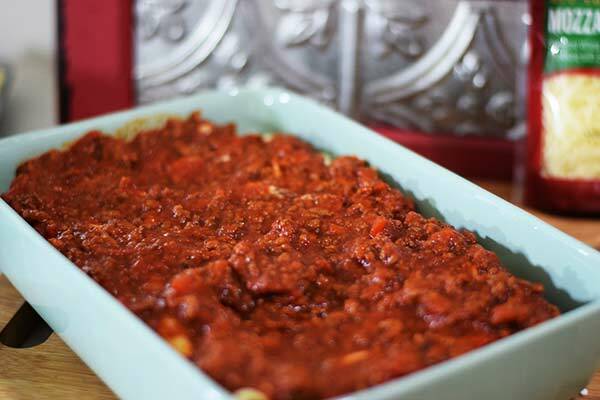 Step 3: Spread half of the Kicked Up Spaghetti Sauce on the bottom of a 9 x 13 baking dish. Step 4: Stuff each shell with about 1 heaping tablespoon of the mozzarella filling and place filling-side up in the dish on top of the first layer of sauce. Step 5: Top the shells with remaining sauce. Then top with the slices of mozzarella cheese. Step 6: Bake uncovered in a 375 degrees preheated oven until cheese is melted and bubbly (about 30 minutes). 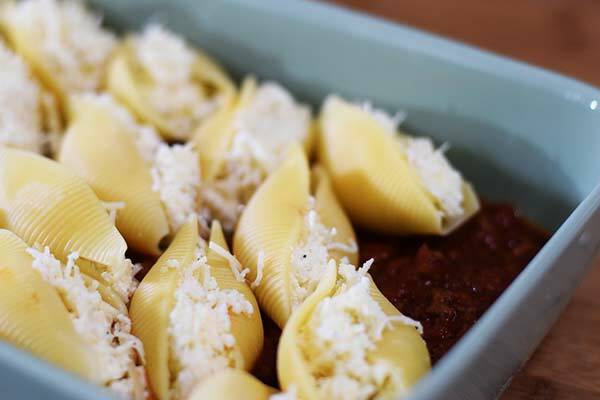 Let it set up about 10 minutes and then dig right into these Easy Baked Stuffed Shells! 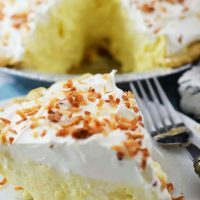 My family goes crazy when I make this and I hope yours will too! 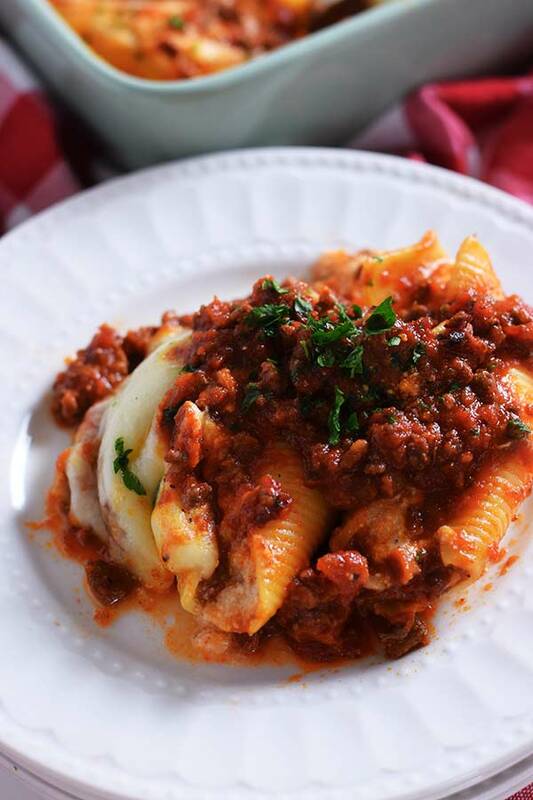 Easy Baked Stuffed Shells are jumbo pasta shells filled with creamy ricotta and Italian cheese baked in an deliciously rich meat sauce. 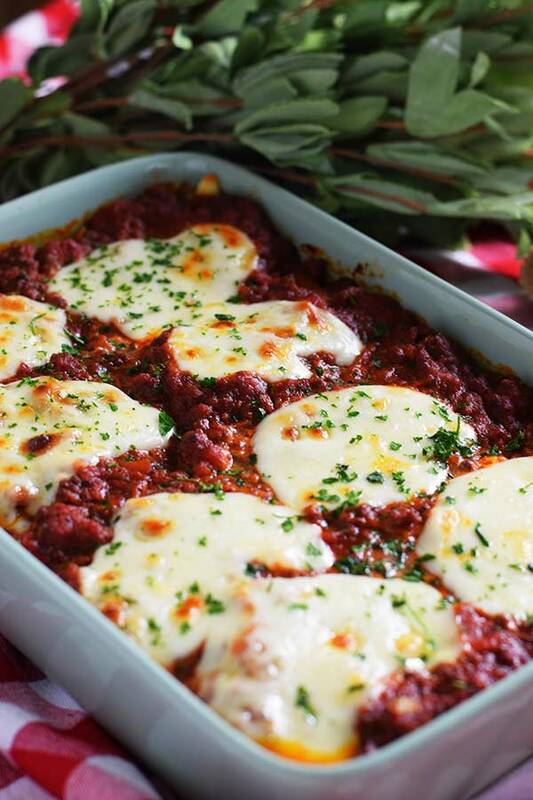 If that isn't scrumptious enough they are topped off with soft fresh mozzarella slices and baked to perfection. Cook shells according to package instructions for baking. Drain and spread out on baking sheet to dry. 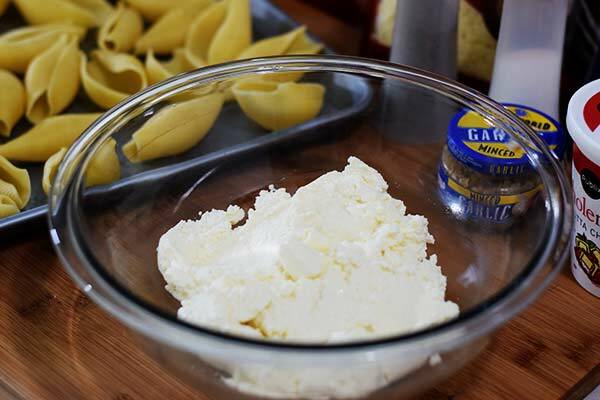 In a large bowl, mix ricotta, 2 cups of shredded cheese, salt, pepper and garlic. Taste and add salt if needed. 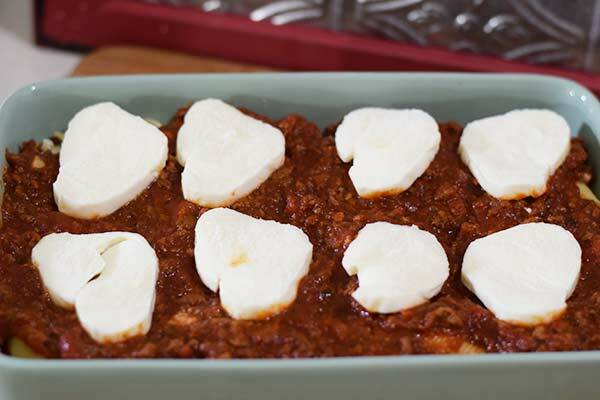 Spread half of the Kicked Up Spaghetti Sauce or Marinara Sauce on the bottom of a 9 x 13 baking dish. Stuff each shell with about 1 heaping tablespoon of the mozzarella filling and place filling-side up in the dish on top of the first layer of sauce. 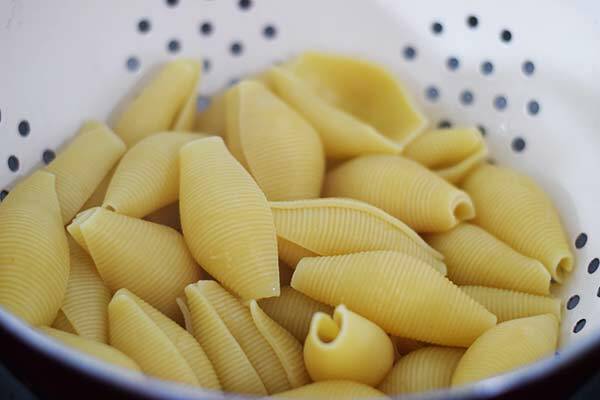 Top the shells with remaining sauce. 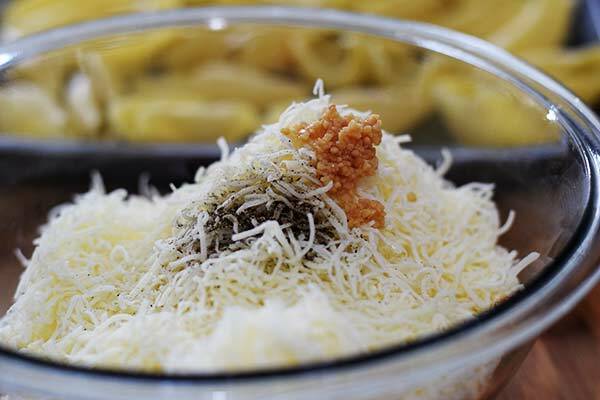 Then top with the slices of mozzarella cheese. Bake uncovered in a 375 degrees preheated oven until cheese is melted and bubbly (about 30 minutes). 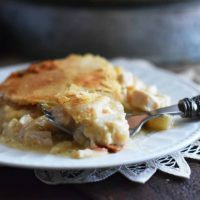 You can also find this on Meal Plan Monday and Weekend Potluck! Wow! This looks so yummy. I love Italian food, Thanks for sharing the recipe!